"A co-worker shared this recipe with me. 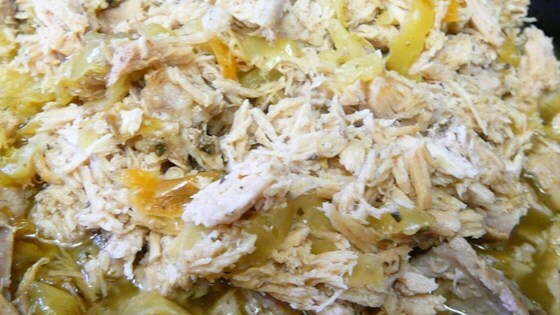 This is another one of my favorite slow cooker comfort foods. I don't know how I survived without this recipe in my life. I am glad I don't have to, and neither do you! I like to serve this on a hoagie or roll with chips and dip. Cook on High for 4 hours or on Low for 8." Place pork tenderloin into a slow cooker, sprinkle meat generously with Greek seasoning, and pour the jar of peperoncini peppers with their juice over the pork. Cook 4 hours on High. Shred the pork using 2 forks and allow to cook 10 to 15 more minutes. Transform pork tenderloin into pulled pork! We liked this and it was a nice twist on pulled pork. It was super easy to prepare and literally fell apart when I touched it w/tongs. Thanks for the change of pace, 6ela! Excellent the only thing I did different was to sear the pork before putting it in the crock pot. It enhances the flavor. Fantastic! This recipe is perfect!